Characterised by long (80-105cm) and lyre-shaped horns; coat colour is white with patches of black, sometimes with red marks on the ears, feet and sides. It is known to have excellent potential as dual-purpose (milk/beef) cattle (Felius, 1995). The original habitat of the White Fulani is northern Nigeria, southern Niger and north-eastern Cameroon with both the Fulani and Hausa tribes; gradually the spread into southern Chad, and western Sudan (where they are referred to as Fellata, and Red Fulani). In Nigeria this breed accounts for about half of the Nigerian national herd, and about 95% of these are owned by the Fulani (Felius, 1995). 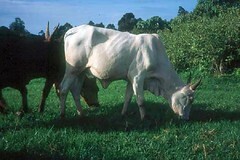 The origins and classification of the Fulani remains controversial; one school of thought is of the opinion that the Fulani cattle are truly long-horned zebus that first arrived in Africa from Asia on the east coast; these are believed to have been introduced into West Africa by the Arab invaders during the seventh century, AD, roughly about the same time that the short-horned zebus arrived into East Africa. This theory is supported by the appearance of the skull as well as the thoracic hump of the Fulani cattle. Another school of thought contends that these cattle originated from the Horn of Africa, present-day Ethiopia and Somalia, and that interbreeding between the short-horned zebu (which arrived in the Horn around the first millennium BC) and the ancient Hamitic Longhorn and/or Brachyceros shorthorn (which had arrived much earlier) occurred in the Horn about 2000-1500 BC. The subsequent successive introductions of the short-horned zebu cattle are believed to have displaced most of these sanga cattle into southern Africa. During this period of constant movements of people and animals within Africa, some of these sanga cattle probably intermixed with the short-horned, thoracic-humped cattle to produce the so-called thoracic-humped sanga. The latter may have migrated, most probably along with the spread of Islam, westerly to constitute what are today the lyre-horned cattle of West and Central Africa, including the Fulani cattle. Originally the White Fulani were indigenous to north Nigeria, south-east Niger and north-east Cameroon, owned by both Fulani and Hausa people. They then spread to southern Chad and western Sudan.